Präwest specializes in manufacturing complex parts. 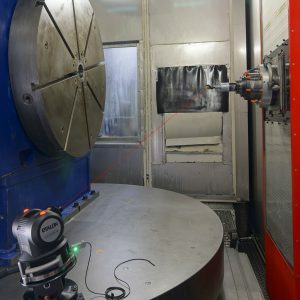 An innovative measuring method used by a high-tech machining company based in Bremen, Germany (a leader in the field of 5-axis milling of complex parts), helps the company improve the accuracy of its four biggest machine tools. Präwest Präzisionswerkstätten captures their machine tools’ volumetric errors with Etalon’s LaserTracer-NG and compensates them in HEIDENHAIN’s machine tool control through the software option KinematicsComp. The result: Dimensionally accurate workpieces without any readjustments—even with demanding free-form parts with diameters of up to 2.5 m (98 inches). Thanks to its focus on innovative production processes and permanent staff training, Bremen-based contract manufacturer Präwest has climbed to the top of the turning and milling market. 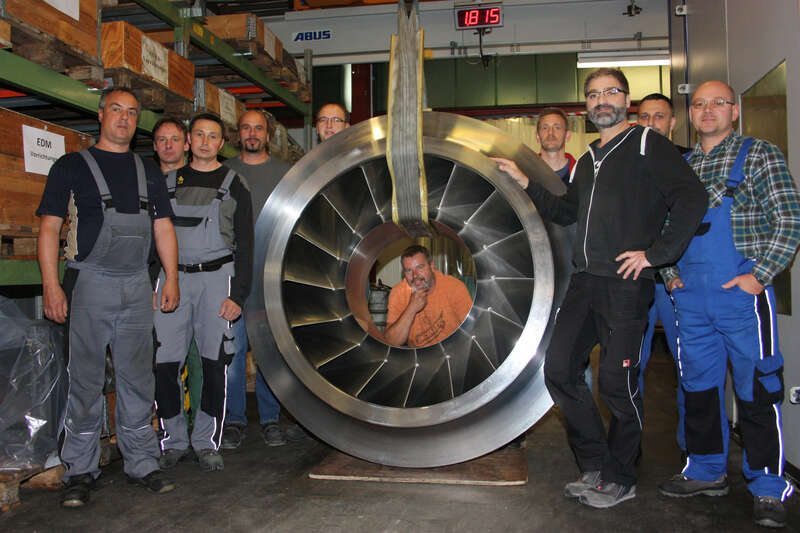 Customers include big players from the aerospace industry such as MTU, Rolls-Royce, and Mitsubishi Heavy Industries ordering impellers, blisks, turbine shovels, and structural components. Also renowned industrial groups, e.g. MAN, Siemens as well as businesses from the oil and gas sector, appreciate the expertise of the German precision manufacturer. The workpieces often show complicated geometries or are extremely big and heavy, not to mention their strain and stress. In addition, customers frequently ask for elaborate additional processing, e.g. chromate coating or heat treatment, even for a batch size of one. Daily business is also the processing of difficult-to-machine materials such as the superalloy Inconel 718 that contains a high percentage of nickel (50%). The manufacturing complexity becomes apparent, too, when looking at the number of required tools: “To turn a single workpiece to the desired shape and dimensions, it is often necessary to apply several hundred tools including milling tools with lengths of up to 900 mm as well as 60 machining programs or more,” reports Gaylord Klammt. 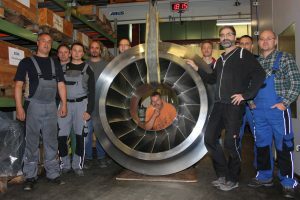 A true Präwest masterpiece is, among others, a one-of-its-kind shrouded impeller made of stainless steel that has an external diameter of 1,780 mm (70 inch), thus breaking the mold of common dimensioning. 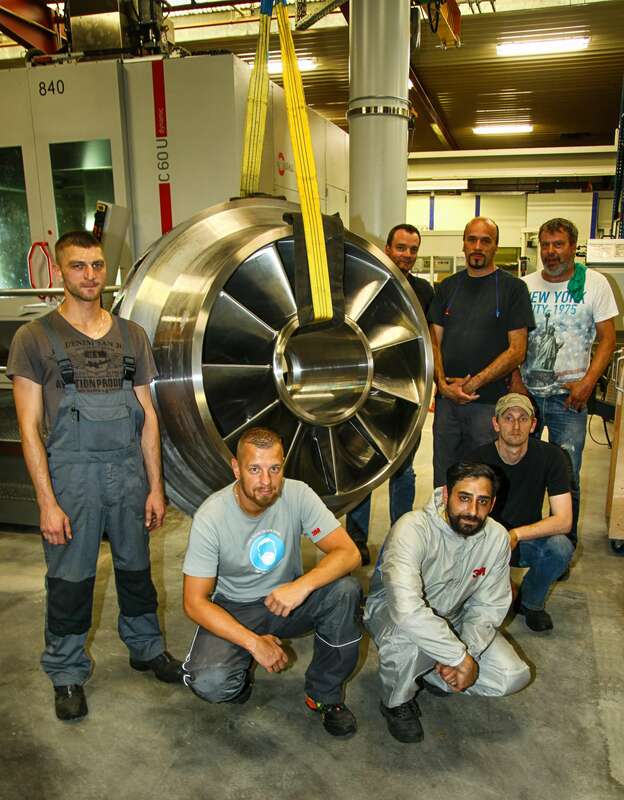 Or the extra-large shrouded impeller with solid blade, which stuns even experienced industry experts due to its size of 1.50 m.
Producing such complex parts with very high quality and simultaneously having a lock on the costs would be impossible without a sophisticated manufacturing strategy. Präwest has already started to optimize all elements of the process chain many years ago. “From our milling strategy to the application of highly precise tools and the right machine tools with powerful controls to perfect CAM programming—we are adjusting all relevant parameters,” says Gaylord Klammt. An error in the production process is a clear no-go here—which is hardly surprising: When the sales price of an individual part can have up to six digits, quality comes first. “Our philosophy is to always be one step ahead of the others—or two steps, even better. And this is only feasible with permanent technical innovation,” summarizes Gaylord Klammt the company’s approach. The more delicate the processing of a certain material, the more important becomes tool quality. As a consequence, decades ago, Präwest has decided to take tool manufacturing into the company’s own hands and establish an in-house grinding shop. 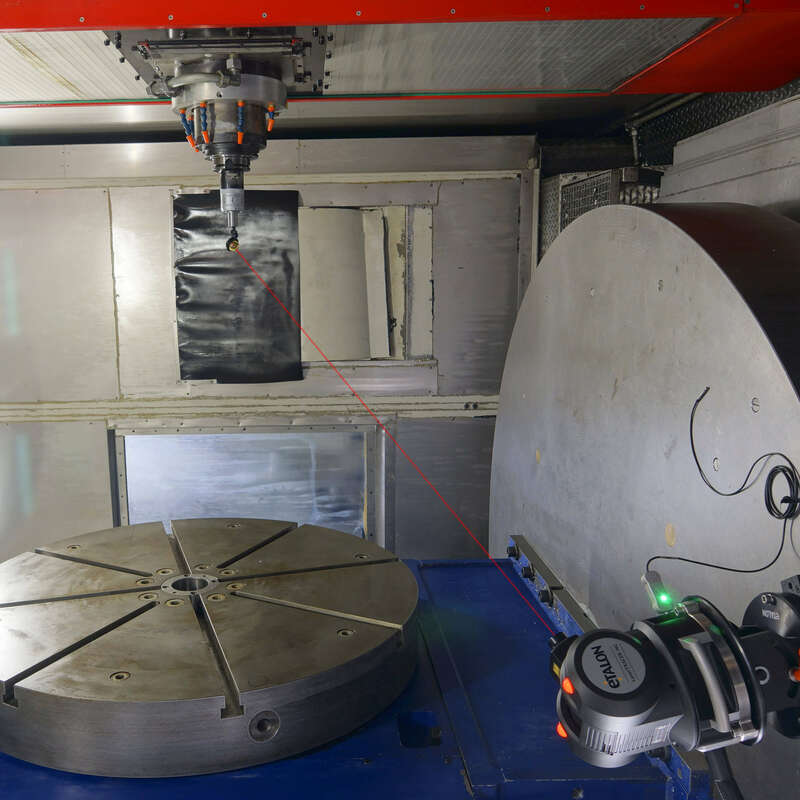 “This empowers us to optimize the tools right at the cutting edge which results in better endurance even when processing superalloys, combined with best surface quality and geometric precision,” states Gaylord Klammt. Plus, the company has learned a lot about the interaction between tool and machine. “We have gained in-depth knowledge about our manufacturing technologies, which makes it easier for us to control every single element,” reveals Gaylord Klammt. Also with respect to cost efficiency, in-house tool production has paid off: It has helped reduce the traditionally high tool-related cost level in the manufacturing of aerospace parts, which are produced in series over a period of five to seven years. The large-scale acquisition of top-notch machine tools also contributes to Präwest’s high manufacturing quality: More than 40% of the machines are not older than three years. Last year alone, Präwest invested in ten new milling machines. But that was only the beginning. Despite extensive research, Präwest couldn’t track down a perfect machine tool for the manufacturing of large parts. Hence, the precision manufacturer has decided to develop its own 6-axis milling machines with parallel axes. “These unique machines reflect our manufacturing know-how,” says Gaylord Klammt. “They are better with regard to stiffness, speed, machine volume, installation space, and operator convenience, and they are particularly optimized for milling complex parts such as open and shrouded impellers. They master a product range of 500 to 2500 mm (20 to 98 inches) in diameter and feature dynamic processing for up to 15 metric tons of loading.” The machine tool control comes from HEIDENHAIN. Präwest is also very pleased with the control manufacturer’s service. “Functionality is only one side of the coin. The best control isn’t worth a bean if in the end you’re left struggling on your own. Thanks to HEIDENHAIN’s support, we managed to get maximum contour accuracy and speed out of our milling machines,” summarizes Gaylord Klammt. Although Präwest’s 6-axis milling machines were constructed in the best possible way, their geometrical accuracy did not yet meet Präwest’s high demands. The milling experts detected systematic geometry errors of the linear axes and rotary axes. These errors may be acceptable on small machine tools with wide manufacturing tolerances, but they are causing trouble on large machines with parallel axis that are supposed to produce high-precision parts: Systematic errors from different sources add up to an unacceptable total error, on the one hand due to large movements in the six axes, on the other hand due to the immense size of the tools. “When machining big workpieces, you mill in different sectors and finally meet in the middle. Many parts require reversal and re-clamping during manufacturing, which also leads to imprecision. When mismatch occurs, our staff has to rework the part or adjust the programming—and that costs money and time,” emphasizes Gaylord Klammt. 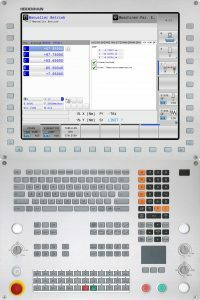 Because of small batches and expensive materials, Präwest cannot allow test running the NC programs. “Consequently, the question was: How do I manage to produce a dimensionally accurate part in six axes of movement when the part is more than two meters long and the accuracy tolerance is only ± 0.05 mm (±0.002 inch)?”, explains Gaylord Klammt. 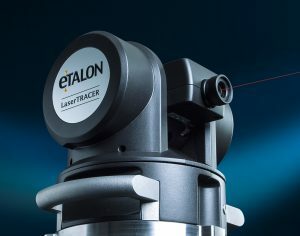 The measurement equipment manufacturer Etalon provided the answer: The German company has developed a self-tracking laser interferometer specially dedicated to increasing the accuracy of machine tools by means of volumetric compensation. 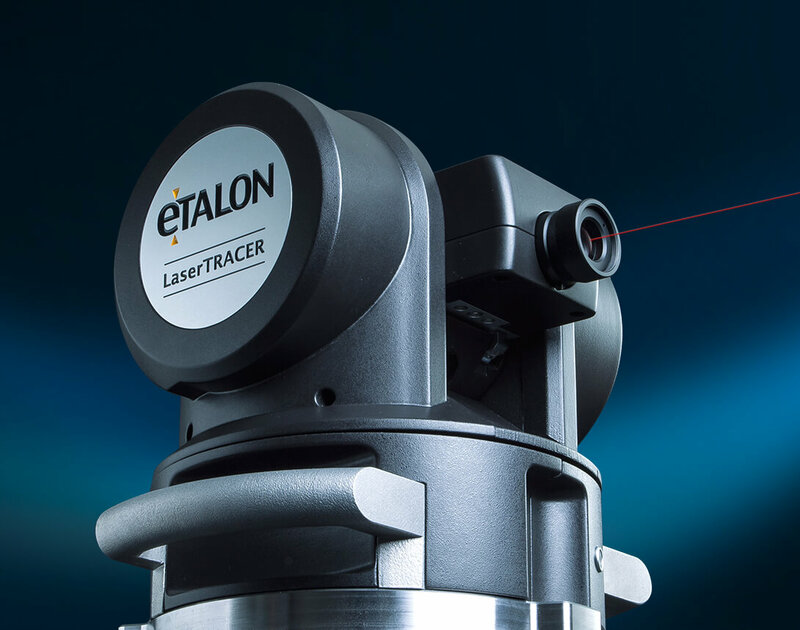 With Etalon’s technology, it is possible to calculate exact compensation values for spatial errors in all degrees of freedom. 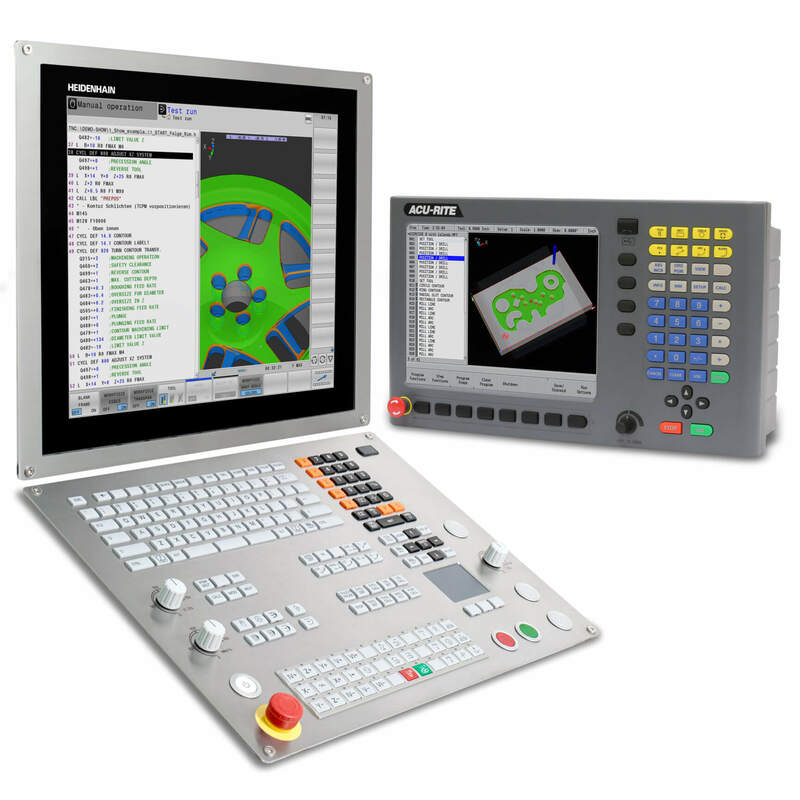 With micrometer accuracy, the system analyzes position errors, straightness errors, rotation errors (pitch, yaw and roll), and squareness between the axes in the whole working volume of the machine tool. Angular positioning deviations, axial and radial movements, and wobbling of the rotational axes are comprehensively recorded as well. Thus, the LaserTracer-NG fundamentally differs from conventional laser interferometers that involve elaborate aligning and generate a large amount of work for determining pitch, yaw and roll. 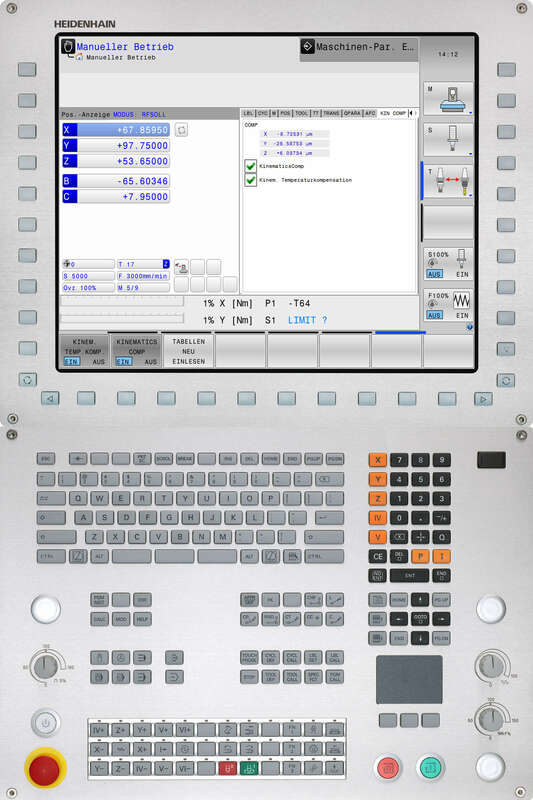 After measurement data acquisition, Etalon’s software calculates the volumetric compensation data. Because it is interfaced with the machine controller, this data gets automatically transferred to the machine. 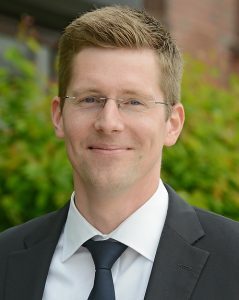 To experience the performance of the LaserTracer-NG in connection with KinematicsComp first hand, Gaylord Klammt invited both Etalon and HEIDENHAIN to conduct test measurements. “I admit: I made Etalon measure the geometrically poorest machine. I wanted to see what kind of results the LaserTracer-NG would produce when being confronted with such highly unsatisfying kinematics. And if an investment in this measurement system would really pay off,” discloses Gaylord Klammt. ISO verification with LaserTracer-NG: The measurement process does not require fine alignment of the measurement system. The LaserTracer-NG is a high resolution interferometer that automatically follows a reflector continuously measuring the distance to it. The system features an unprecedented accuracy of the center of rotation, which is realized by means of a reflective sphere with a form uncertainty of less than 0.1 μm. The patented beam guide makes sure that this sphere can serve as reference for the interferometric displacement measurement which is therefore conducted with highest dimensional precision to the tool center point (TCP). Consequently, mechanical deviations of the rotation and swivel axes are also acquired with very high precision. Measuring uncertainty for spatial displacement (95%) amounts to 0.2 µm + 0.3 µm/m. 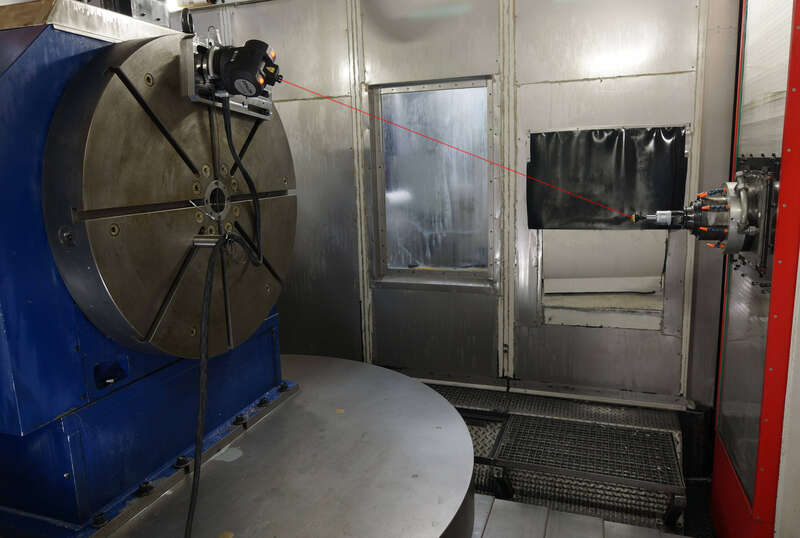 For conducting the measurement, Stephan Kunath places the compact LaserTracer-NG in the machine volume several times without any particular fine-alignment. Instead of a tool, the reflector is clamped in the spindle. Then, the measurement system is ready to start the automated measurement process: It tracks the actual path of the machine in its entire working space. The required NC programs are automatically generated by Etalon’s software, and the respective distances to the tool center point are determined interferometrically. 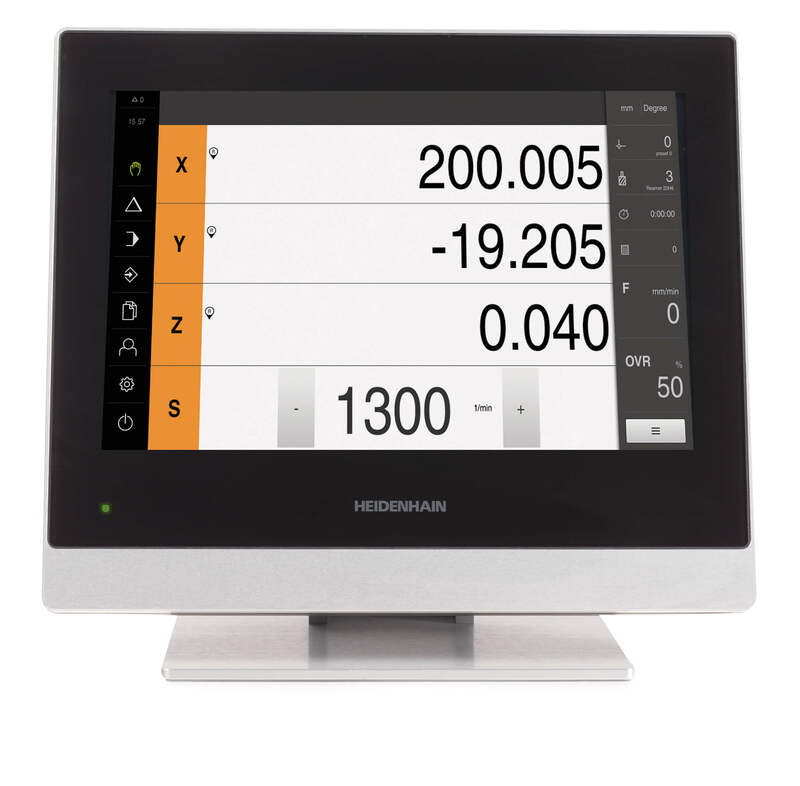 Etalon’s system transfers the recorded measured data to the connected Trac-Cal measuring software, which automatically analyses the measured data and transfers the volumetric compensation values to HEIDENHAIN’s iTNC 530 controller via KinematicsComp. Rotation axis calibration of a large machine tool with axes travels of 2.5 x 2.3 x 0.8 m³. The LaserTracer-NG—mounted on a rotary table with a diameter of 1.2 m—is positioned stationary in the machine several times.